I stuck my video camera on a RAM mount on my buddy George Primm’s bike and asked him to hang with me on a ride through West Palm Beach and Palm Beach. George was a copy editor in his former newspaper life, not a photographer, but he did an OK job. 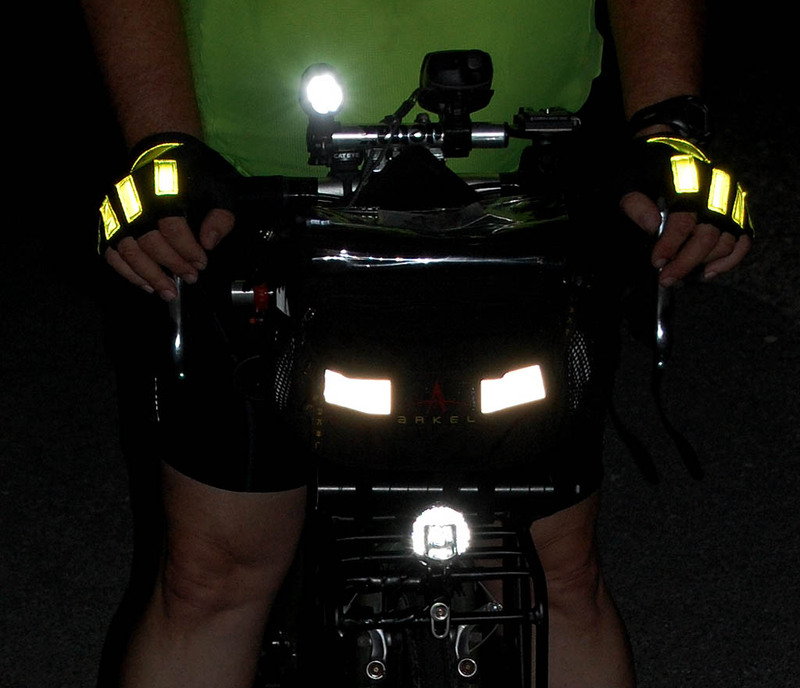 His bike had some fairly low-powered lights, so the reflectors would have shown up much brighter in car headlights. 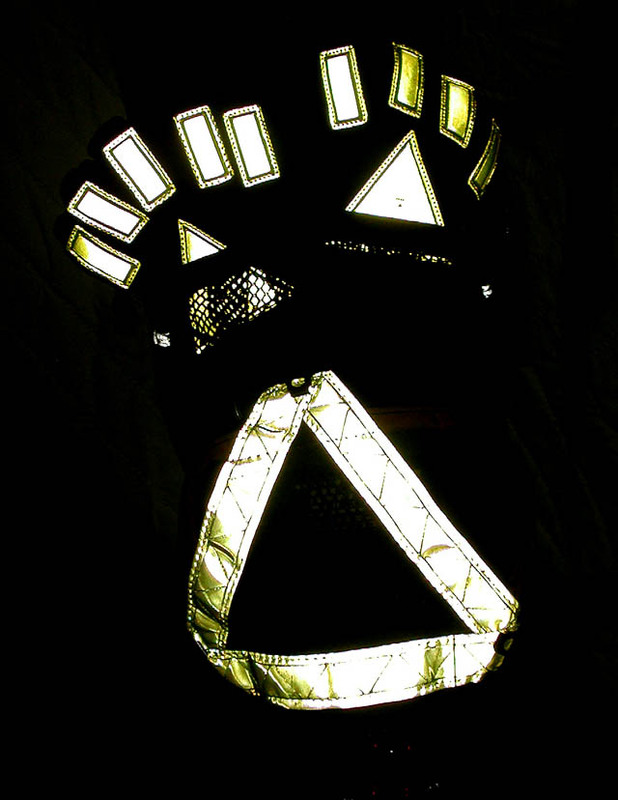 Still, you can get a pretty good idea of how your signaling is much clearer with the Glo Gloves. I’m a night rider. I like it because it’s cool and traffic is calmer and better behaved at night. To see and be seen, I have a SON generator powered B&M Lumotec IQ Cyo R N Plus light on the front, along with at flashing 5-LED ViewPoint Flare. In the back, I have two taillights. A huge 4×6-inch 18-LED RealLite flashes like a billboard and a solid generator-powered B&M Busch&Müller 4DToplight Senso Multi with battery standlight. I used to have a NiteRider taillight, but my battery died and I haven’t felt the need to replace it. I have a large Slow Moving Vehicle Triangle on the back of my CamelBak M.U.L.E.. 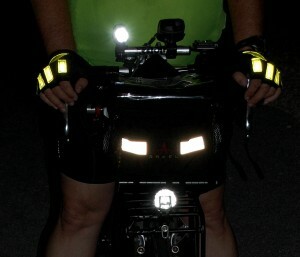 I also stick my Glo Gloves where they add some flash back at vehicles behind me when I’m not wearing them. 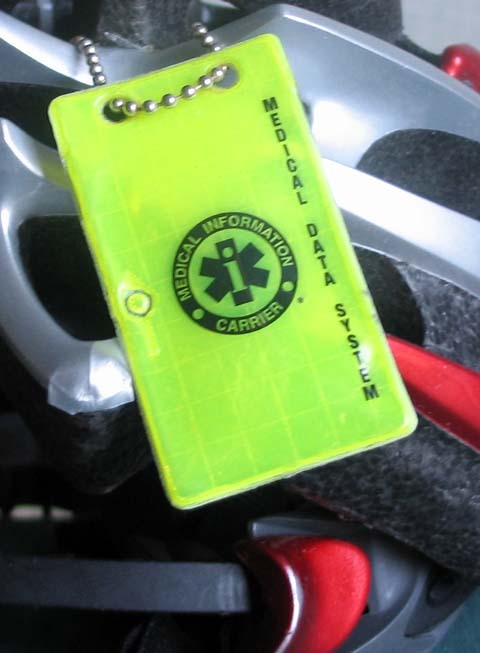 After my riding partner had an accident in the middle of nowhere and I didn’t have any contact info for her family, I wear two Medical Data Information tags made of reflective material. One is attached to the back of my helmet (you’ll be able to see it flashing in the video); the other is on the Camelbak. So, what are Glow Gloves? In 2003, someone named Glolady asked if any of the folks on the phred bike touring list would like to test some prototype gloves. Shortly after I volunteered, a pair of Glow Gloves arrived. 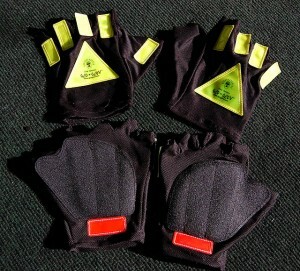 They looked pretty much like the Original Glo Glove shown on the web site. I really liked the large red triangle on the palm, but they weren’t overly comfortable on the bike and they tended to slip on the bars. They were redesigned with the red reflective material higher on the wrist and a better gripping palm and named the Sport Glove. I still didn’t like them as a standalone biking glove, because they didn’t have enough padding in the right places for my taste. What I DID discover was that they were stretchy enough to pull right over my normal gloves when I wanted that extra bit of visibility. I’ve been riding with some new folks lately and I’ve been stressing about how you need to claim your space on the road and to clearly convey your intentions. I pulled on the Glo Gloves and found myself interacting with drivers more (and not just with a single digit). If I’m coming up to an intersection and see a car that looks like he may pull out, I’ll holler or whistle loudly while holding up a highly reflective hand. It’s actually more effective than my Delta Airzound Bike Horn in some cases. As I pass the intersection, I’ll give a friendly wave “thanking” them for doing the right thing, like not running over me. Another nice thing is that the gloves add reflectivity to the front and sides of your bike when your hands are on the bars. Editor’s note: My Glo Gloves were provided for evaluation in 2003 and GloLady was kind enough to send me a new pair for review to make sure that I had the latest version. You can go to the Glo Glove website to find a dealer. That’s pretty neat stuff. I was reading a review that RUSA did a while back on various reflective items. Their conclusion was that the stuff Rivendell sells (made out of 3M and Reflexite) is quite possibly the brightest substance on earth :) Even when wet, which I never knew before that a lot of modern reflective materials lost some of their reflectiveness when wet. A pretty big deal here in FL. Sorry, should have been 3M Scotchlite and Reflexite. Here’s a link. The reflective items are at the bottom. Thanks for the link. That’s my SMV triangle. I cut the strap off it and use ID card clips to attach it to my Camelbak. I put another one on my left pannier when I’m using one. These are great! I’m tempted to buy them, but I need much warmer gloves for winter. I think I’ll buy some reflective tape and attach it to my winter gloves in the same pattern. Okay, I’m sold. VERY impressive. On another note, you had better get your buddy George over to see your bike shop friend Wayne and get that shifter adjusted. The grinding of the chain and sprocket (unless I am mistaken, could have been George is a metalsmith and was working on a very large piece while riding…) made me queasy. Usually that is the noise you hear behind you going up a steep hill as someone goes through all their gears before snapping the chain. They are so stretchy that they’ll fit right over your regular gloves. If you’re cold, they’ll add a little more warmth. That was one reason I didn’t wear them much down here at first: I didn’t need warmer hands in Florida. I’m a casual rider of my old Trek “multi-trek” bike and don’t have a clue what the sounds my bike makes mean. I wear hearing aids and can barely hear them anyway. Thanks for the tip. I’ll take the bike in for a checkup. Thanks for the video/flagging the gloves. They look interesting for sure. I am curious but as to how well they reflect from the front. Is the red (seems the wrong colour for the front too) very effective? The yellow on the top of the hand and fingers works VERY well. It makes your hand show up very brightly if you signal like I do, with my palm forward and the top of my hand and fingers oriented to the rear. The red at the near the wrist is disappointing. It’s not bad to signal a biker close behind you that you’re going to slow down (arm down at a 45-degree angle and palm back), but I usually rotate my with palm forward for any signal I want to convey to the rear. The yellow is so much brighter and has so much more surface area. If you go to the Glo Glove web site, they make some gloves with large red reflective material on the palms for people directing traffic. The first prototype I tested was similar to those, but the material was a little stiff and didn’t feel good on the bars, so they changed the design. I think my kids would love these gloves!